The Nature Center at Shaker Lakes is having 3 rain barrel workshops in April. If I had to choose my favorite “gardening” thing, it would be my rain barrel (with my reel mower being a close 2nd). 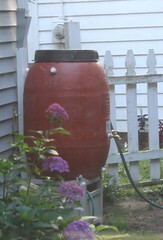 Rain barrels gather rain from your roof and store it so you can use rainwater to water your lawn and garden. It saves your water bill, saves the city water plant, and helps your plants. Grass and plants don’t need cold, treated water. They love rainwater! So, head up to Shaker Lakes and build your own rain barrel. You can have a lush, green, healthy lawn all summer. I have 3 rain barrels, I purchased them about 2 years ago. A great investment. The interesting thing is that I have people who stop at our home and ask me, “what is that”? Then I explain to them what “it” is and what “its” purpose is. It makes me smile, to show folks how to have happy plants, save money, and limit storm water run off. I am eager to see how many folks stop by when the rain garden goes in. I’m the same way! I tell everyone I can about rain barrels. It’s just such a great idea. You can buy them for about $85. Or, you can head up to the Nature Center at Shaker Lakes and make one for less than $50. I need to learn how to make them. I keep checking to see if there are any work shops closer to home. Lorain County is so far behind and the city of Lorain is even worse. I think on our blog we will have to do a feature again about the rain barrels and a documented featured article when we put in the rain gardens. Now to get Lorainian’s to understand that it is good grow your own food, they used to do these things just not anymore.